Dogtooth tuna video recently shot in Gorontalo is now available for viewing. Although Gorontalo is famous for its Yellowfin tuna, the tuna that divers will most likely see here is Dogtooth. This tuna is one of the apex predators like Giant trevally and large groupers. They eat smaller schooling fish that thrive off Gorontalo’s coral walls. These include fusiliers, fairy wrasses, scads and rainbow runners. As evidenced in the Dogtooth tuna video, these fish are curious about divers. As a result, they will often make several passes, giving time for visitors to get cameras ready. A prime dive site for viewing larger schooling fish is Buffalo Head Point. It numbers among Gorontalo’s many submerged points. These points jut away from the cliff above water and away from the underwater coral wall. Moreover, this position interrupts the smooth flow of the area’s longshore current. When a strong current is running, schooling fishes will congregate off these submerged points. On the day this Dogtooth tuna video was shot, the current was moderately strong. Also, the plankton count was high. Notice all the backscatter in the video. That is living plankton. As a result, schooling fish that feed on plankton gathered in abundance. Notice the Blue-and-yellow fusiliers in the video. This is the kind of fish that fast swimming Dogtooth tuna love to eat. Although dive staff often see large fish in these conditions, everyone was surprised with the close encounter with schooling Dogfish tuna. The scientific name for Dogtooth tuna is Gymnosarda unicolor. Unlike other sarda, this one lacks scales. Hence its official name, since gymno means “naked” in Greek. This silvery fish is considered unicolor, in contrast to other tunas like Yellowfin or Bluefin. It sports a single, undulating lateral line. Divers can easily recognize this streamlined fish. It has white tips on its upper and lower back fins. The caudal peduncle also shows a white area. These white markings are clearly visible in the Dogtooth tuna video. Also, notice that the fish’s upper jaw extends even with its eye. This fish swims with its mouth open, showing its many conical teeth. The average size of Dogtooth tuna that divers see swimming along Gorontalo’s coral walls is between 40 to 120 centimeters. Mature fish can measure up to two meters in length and weigh up to 120 kilograms. These swim in depths as deep as 300 meters. Miguel’s Diving staff estimate the larger ones seen in the Dogfish tuna video weighed about 50 kilos! 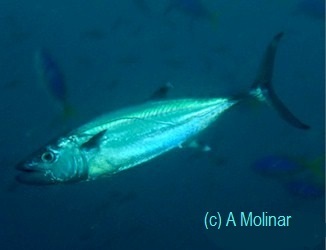 This tuna species lives in tropical waters of the Indo-Pacific region. For your chance to see Dogtooth tuna in Gorontalo, please book your dive trip with us! Thysanoteuthis rhombus egg masses are rarely seen. However, one of them drifted near Miguel’s Diving speed boat during a surface interval. It looked like a giant pink and transparent version of a child’s slinky toy. Mysterious, deep water squids lay eggs in spirals. A gelatinous case holds the long spirals together. After the fertilization process is complete, the egg mass will float with ocean currents near the surface. Thysanoteuthis rhombus egg masses can measure up to 1.8 meters in length. Each tiny pink pearl is actually a squid egg. 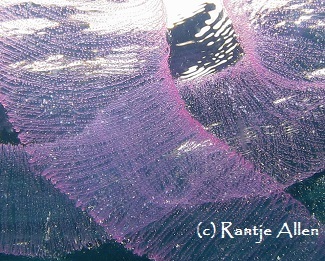 A single egg case carries between 24 and 43 thousand eggs inside its transparent case. The egg mass the Miguel’s Diving staff discovered measured about one meter. Thysanoteuthis rhombus egg masses drift with strong currents in warm tropical waters. Seeing them is indeed a rare event. This occurrence marks only the second time Miguel’s Diving staff have discovered this type of egg mass during our 16 years of operation. This deep water squid is sometimes called diamond or diamondback squid. It has distinctive fins that run its body length. Its scientific name, Thysanoteuthis rhombus, describes its rhombic shape. Its arms are noticeably short. However, it can grow up to 100 centimeters and weigh up to 30 kilograms. This diamond quid lives in the deeper parts of the ocean during the day. Trawlers have found it at depths below two kilometers! 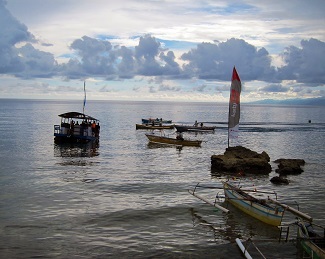 Since Tomini Bay, where Miguel’s Diving operates, plunge to twice that depth, no one should be surprised to learn deep sea squid live in Gorontalo waters. At night, it will rise nearer the ocean surface. It is found worldwide in tropical and subtropical seas. 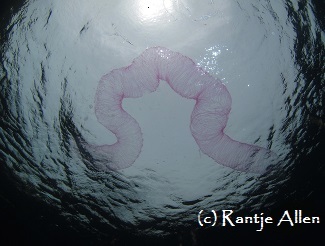 The beautiful Thysanoteuthis rhombus egg masses come from mating pair. 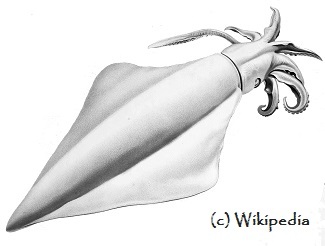 The diamond squid are the only cephalopod known to remain in the same mating pair for life. Fishermen observed that if one of the pair is caught, its mate will remain in the area until it is caught as well. Diamond squid naturally live about one year. This squid is fished commercially in Japan. Other predators include tuna, swordfish, sharks, Rough-toothed dolphins, as well as False Killer and Sperm whales. Miguel’s Diving staff have observed all of those predators in the Gorontalo waters of Tomini Bay. Although divers are unlikely to see these deep water Thysanoteuthis rhombus egg masses anywhere in the world, our guests often see other pelagic species. 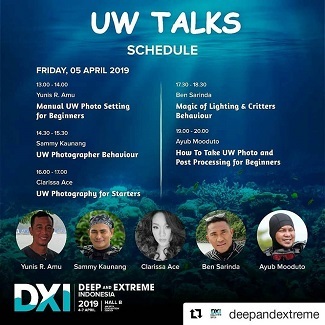 For your chance to meet deep water marine life in Gorontalo, please book your dive trip with us. Melibe viridis is a highly unusual nudibranch found throughout the Indo-Pacific region. It uses an oral hood like a net to capture live prey to eat. Imagine the surprise of divers to see a brownish mass twisting in the current over a muck diving site! That turned out to be a rarely seen Melibe viridis nudibranch. Viridis is a term describing young foliage. This is an apt description of a creature with parallel branches growing at spaced intervals and perpendicular to its body. Without movement, this creature would blend perfectly into the coloration of the ocean bottom. Numerous bumps and tufts mark M. viridis distinctively. One diver captured these movements in a dramatic Melibe viridis video. This one measured about 8 cm long. Notice that its front left branch is stripped of its warty bark. On another day our divers found one measuring only two centimeters. This second M. viridis had somehow lost all its branches. Some had started growing back. However without those distracting cerata, divers could clearly see the way this nudibranch crawls on the long central foot. It leaves a mucous trail. This small one appears the second part of the video. Water that day was much greener than the previous day. Watch this nudibranch twist its body and launch itself into the current. With twisting movements of its body, it succeeded in moving farther along the sloping sand bottom. 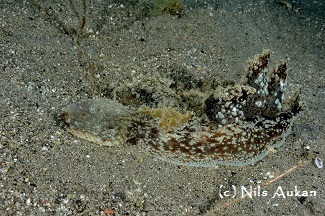 Melibe nudibranchs have a unique way of searching for food.They are active carnivores and use an oral hood. Imagine the divers’ further surprise to watch this nudibranch hunt for food. In a rhythmical manner, the nudibranch will cast its hood forward. 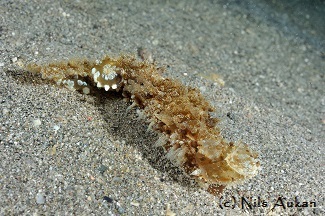 On the inside edges of the oral hood, this type of nudibranch has short papillae, which sense movement. Sometimes, these are visible in the video. The Melibe tries to trap small crabs and shrimps its oral hood. Once trapped, the live prey gets dumped into the oral opening for consumption. The video clearly shows this unique way of hunting for food. Worldwide, there are about 17 valid species of Melibe. Like other nudibranchs, Melibe are hermaphrodites. M. viridis grows up to 13 centimeters. Its color varies widely from light to dark, depending on the coloration of the substrate. Only lucky divers will ever see a Melibe viridis searching for prey. 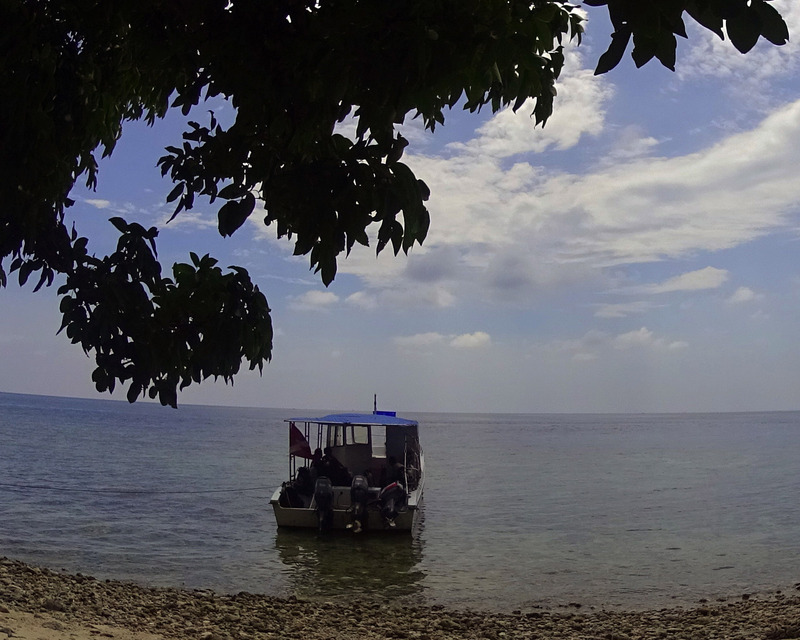 However, for your chance to see one in Gorontalo, please book your dive trip with us. Acanthosphex leurynnis, a rarely seen type of waspfish, recently made an appearance in Gorontalo. During a great muck dive in February 2018, one of our guests discovered an unusual fish. Initially, Miguel’s Diving staff assumed it was a juvenile Cockatoo waspfish, which is often seen at the Tambo’o Fish House Dive Site. That muck site continues to thrill divers with its variety and density of marine critters. Fortunately, Wolfgang from Germany took a photo of the fish. Then staff sent the photo to a marine identification community on Facebook. A longtime marine biologist working in Pacific Asia identified the fish for us. It turned out to be a Wasp-spine velvetfish. Its scientific name is Acanthosphex leurynnis. It is the only species in its genus. This fish is so seldom seen that it is missing from even large volume fish books. The Smithsonian Museum of Natural History possesses specimens of Acanthosphex leurynnis from Thailand, Malaysia, the Philippines, Japan and Australia. The Wasp-spine velvetfish grows to a maximum of nine centimeters. Its coloration tends to be dark to light mottled brown. Additionally, white patches occur randomly on its body. It has two spines pointing behind its eye and four more behind its chin. Also, the chin has a pair of short tentacles. Given its small size and camouflaged coloration, divers rarely see this singular fish. 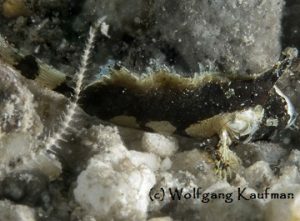 Although Acanthosphex leurynnis is not technically a waspfish, it is generally grouped with waspfish species. Worldwide, there are forty species of waspfish. However, because they are secretive and nocturnal, divers rarely seen them. Some waspfish have venomous spines that can cause painful stings. Waspfish eat shrimps and other small invertebrates. Typically, the tall dorsal fin on the head is the distinguishing characteristic of waspfish. 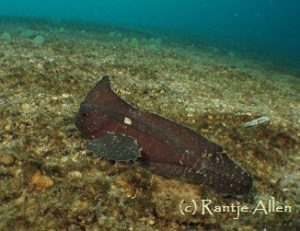 Besides the unusual sighting of Acanthosphex leurynnis, divers in Gorontalo are most likely to see Cockatoo waspfish (Ablabys taenianotus). This fish has great camouflage and looks like a dead, brown leaf laying in the sand. They are often in pairs. So, careful divers will look for another one if one is already found. Although this waspfish tends to be dull brown, it can have white on its face. In Gorontalo, divers will only see waspfish at a single dive site, Tambo’o Fish House. A careful diver will check each dead leaf lying on the sand. If spotted, a waspfish will pretend that a slight current is pushing it about and moving it away. The motions are quite clever! It lives in the western Pacific Ocean, including northern Australia and Japan. Despite what some guidebooks or interet postings claim, it does not live in the Indian Ocean. The waspfish that lives there is a different species, Ablabys binotatus. Actually, another waspfish lives only in Indonesia and the Philippines. It is the Spiny waspfish (Ablabys macrancanthus). Distinguishing it in the ocean from the Cockatoo waspfish is extremely difficult. 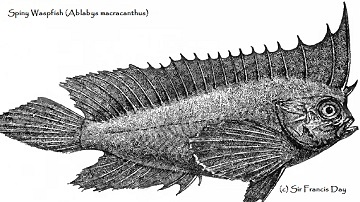 According to marine biologists, the spines of the Ablabys macrancanthus protrude from its dorsal fin. Hence its common name Spiny. The guaranteed way to distinguish between the two species is to count dorsal spines. The less common Spiny waspfish has 15 to 16 and the more widespread Cockatoo waspfish has 17 to 18. Few divers will wish to count waspfish spines! 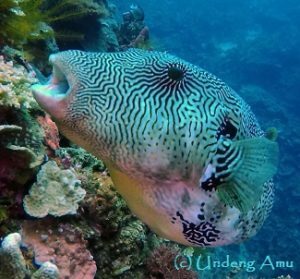 However, for your chance to see a waspfish in Gorontalo, please book your dive trip with us. Beach cleanup proclaimed by Indonesian Marine Fisheries Minister Mrs. Susi Pujiastuti officially included Gorontalo. Indonesia enjoys an extremely popular Mminister of Marine Fisheries. Her colorful past and forthright attitude speak to the hearts of many Indonesian citizens. She is most famous for her by-line “Sink it!” During almost four years as minister, she has sunk over 360 foreign vessels caught illegally fishing in Indonesian waters. With her usual personal charisma, Ibu Susi announced plans for a nation-wide beach cleanup. She calls her organizational teams Pandu Laut Nasional. “As proof of loyalty and love for the Republic of Indonesia, Pandu Laut Nasional will do beach cleanup in 73 beaches from Sabang to Merauke, Miangas to Rote.” She also added, “If we don’t begin now, when will we? 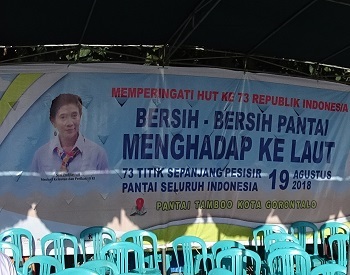 So, our plea is that all Indonesian citizens, including the youth, will form a marine alliance along with Pandu Laut and go to the ocean on 19 August.” Indonesia’s Independence Day falls on 17 August. With the help of her provincial partners, her ministry identified the 73 locations and designated them for beach cleanup. If no beach is handy, she urged residents to clean up nearby rivers and lakes. Ibu Susi herself will help with the beach clean in Bitung, North Sulawesi, after she sinks some more ships. With an eye for simultaneous broadcasts, Pandu Laut Nasional coordinated the times. The hope is for one million people to get involved. In a nation as large as Indonesia, a giant beach cleanup like that is certainly possible. In Gorontalo, the beach cleanup started around 1400 hours. 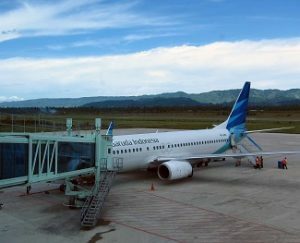 The organizing committee in Gorontalo included Provincial Marine Fisheries, Environmental Research and Tourism departments along with local universities and police. Local dive entities like POSSI and Miguel’s Diving also participated. 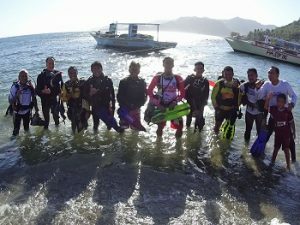 About twenty scuba divers participated. They selected Tamboo village for beach cleanup. It is in the Leato Selatan neighborhood of Dumbo Raya sub regency. It is at the edge of Gorontalo City. Miguel’s Diving staff considered this a great choice since the area is the worst for trash. Three of our dive masters worked as a team. They carried a large plastic dive gear box. They dove to 18 meters and worked their way back up the sandy slope. It took less than 20 minutes to fill their box. Before surfacing, the team clocked the appropriate three-minute safety stop. They surfaced just in time to join others on the beach to sing “Indonesia Raya.” That is the national anthem. A drone captured the event for live broadcast. Various print and online media also covered the event. According to a study released by the University of Georgia, Indonesia is among the top ten nations contributing plastic waste into the oceans. The nation puts an estimated 0.48 to 1,29 million metric tons annually in its seas. Ibu Susi has a goal of 70% reduction in this plastic waste by 2025. When interviewed by Kompas online media, Mr. Rantje of Miguel’s Diving explained what trash was retrieved from the ocean in front of Tamboo village. Almost all was single use wrapping, like energy drink mix, shampoo, diapers, plastic bags and beer cans. When guests of Miguel’s Diving dive the reefs of Gorontalo, rarely will they see trash like that. One reason is that our staff do not wait for a beach cleanup day. We pick up trash daily during the course of a dive. To express your appreciation to an environmentally active dive center, please book your dive trip with us.